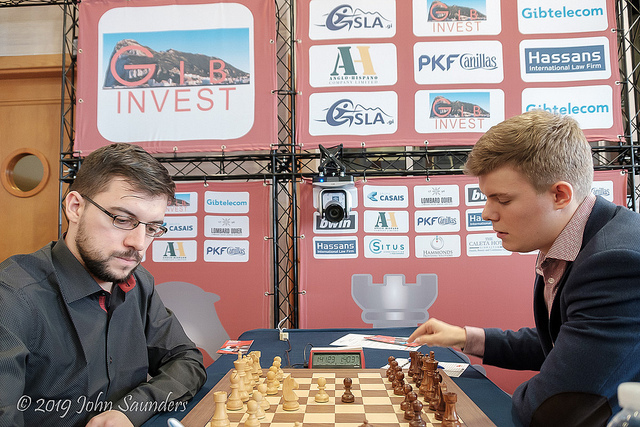 John Saunders reports: Once again 20-year-old Russian GM Vladislav Artemiev has wrested the sole lead after defeating Czech GM David Navara in the penultimate round of the Gibraltar Masters. Artemiev now has 7½ out of 9, followed by three players on 7 points: Maxim Vachier-Lagrave, who beat overnight co-leader Kirill Alekseenko; Yu Yangyi, who defeated Le Quang Liem; and the 19-year-old Indian GM Karthikeyan Murali, who beat Russian GM Maxim Matlakov and is very much the surprise package at the top end of the leader board. The first prize winner can only come from one of this group of four. Three players are tied on the top women’s score of 6 going into the final: sisters Mariya and Anna Muzchuk, and Tan Zhongyi, with Mariya looking likely to have the best tie-break (TPR) score. Round nine was a very good round for the white pieces, with the first players’ combined score over the top 20 boards being +8, =12, -0, including wins on the all-important boards one, two and four. First, the top board: Vladislav Artemiev is showing no nerves in this event and is not intimidated by the calibre of the opposition, with a score of two wins with White and two draws with Black against his last four opponents, rated 2780, 2749, 2767 and 2738. His ninth-round victim was David Navara who, until then, had himself had a splendid tournament. Artemiev bamboozled his opponent, and the engines, with an imaginative exchange for pawn sacrifice and Navara, finding he had no play, gave it back but found himself simply lost. 20.Qxa7!? This exchange for pawn sacrifice is not foreseen by engines which prefer to preserve the f1 rook. 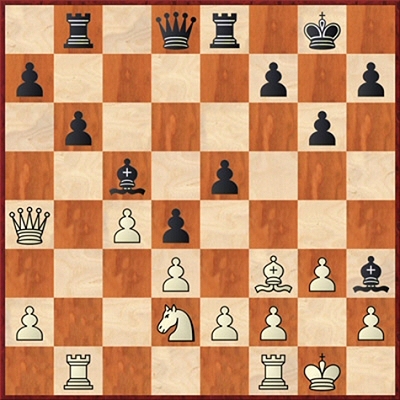 But, with White’s light-squared bishop patrolling the long diagonal it makes sense. 20...Bxf1 21.Kxf1 Re7 22.Qa4 Qd7 23.Rb5 Qa7 24.Qb3 Kg7 25.a4 Ra8? Watching the game in the press room, IM Tania Sachdev was incredulous when she saw this move on the board. It’s become obvious that White has good compensation for the exchange for pawn sacrifice but giving back the material lands Black with the problem of being a pawn down and also some positional problems, such as the dark-squared bishop being little better than a big pawn. 26.Bxa8 Qxa8 27.f3 Ra7 Black hasn’t time to keep the knight out of e4 with 27...f5 because of 28.a5! and a second pawn is lost. 28.Ne4 White can’t save the a-pawn but he can retaliate by taking the b-pawn in two moves’ time, and then retaining the extra pawn with a number of sharp threats. Black is already lost. 28...Rxa4 29.Nxc5 bxc5 30.Rxc5 Ra3 31.Qb4 Ra4 32.Qb6 Ra1+ If 32...Ra6 33.Qc7 and the e5–pawn drops. 33.Kf2 e4 34.Rd5 Black’s last move was a desperate trick hoping for 34.dxe4? Qa3! and Black escapes with half a point. But White is not obliged to take on e4. 34...e3+ 35.Kg2 Qa7 36.Qxa7 Rxa7 37.f4 1‑0 Black resigned as he will soon be two or even three pawns down for nothing. On board two MVL gave Kirill Alekseenko short shrift, telling us later that he had utilised a bit of Ruy Lopez prep he had stockpiled a couple of years previously for just such an occasion. He admitted that, had his opponent found 25...Nc2 the position would have been equal. The move played was a mistake, however, and he wrapped up the game very soon after. 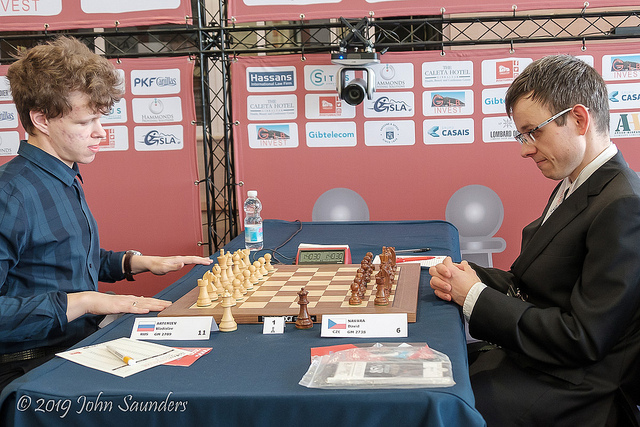 Saric-Aronian opened with a Giuoco Pianissimo but Saric developed a useful edge which lasted quite a while. But it came down to R+PPPP versus R+PPP and couldn’t ultimately be won by the Croat player. Le Quang Liem has proved a tough adversary in this time but he finally subsided to defeat against Yu Yangyi. A Bogo-Indian led to a middlegame in which Black should perhaps have exchanged off White’s dark-squared bishop when he first had the opportunity as a number of small positional weaknesses became magnified and Black was soon in dire trouble. 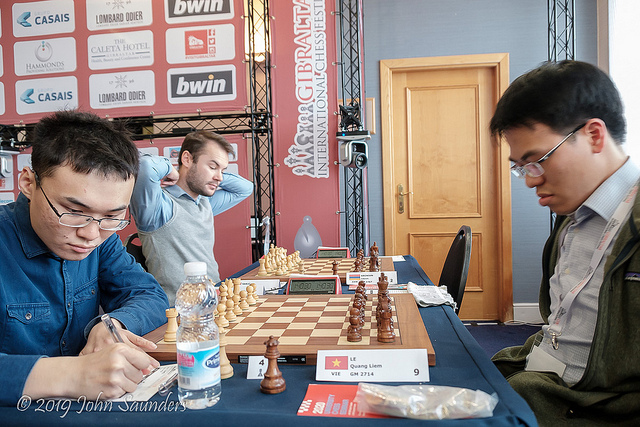 Howell-Nakamura was a surprisingly staid and solid game for these two enterprising players. Nakamura issued a slightly enigmatic post-game tweet: “Solid chess can sometimes just lead to draws which means that sometimes you just have to throw your hands up in the air like what? !” With 6½ points each, neither is now in the running for the top prize. The same applies to David Anton Guijarro and Nikita Vitiugov who drew another Giuoco Pianissimo which wasn’t unlike Saric-Aronian. 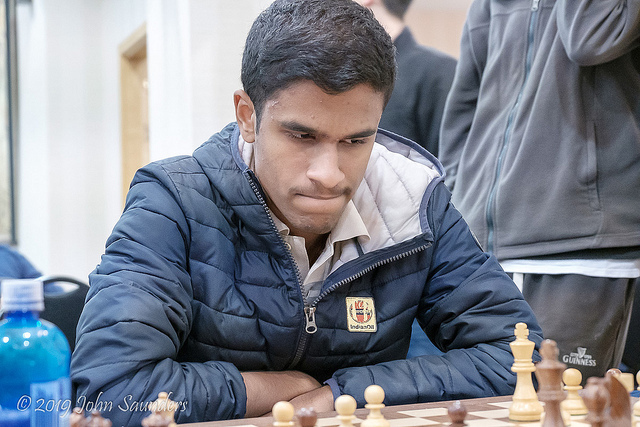 Karthikeyan Murali, however, has a chance of Gibraltar glory in the last round after defeating Maxim Matlakov in a Sicilian over 68 gruelling moves. Only 19 years of age, Murali is 49th in the pre-tournament rankings so must be counted as a complete outsider, although he’s been a GM for nearly three years already. Matlakov’s mistake was probably the decision to push d6-d5 on move 18. Thereafter Murali grabbed the advantage and never let go, though it proved a long and arduous task to exploit the rook and two pawns versus two minor pieces edge. Murali’s reward is the white pieces in the last round against the redoubtable MVL, straining to win the tournament for the first time after being cruelly edged out on tie-break on more than one occasion. The last of the players on 6 points after eight rounds with a chance to win and stay in the hunt for first place was Lalith Babu, who was paired with Wesley So. , who was on 5½. The American tried an exchange for two pawns sacrifice but, though the game meandered onto move 72, the two 25-year-olds could make no impression on each other, so neither is in the running for the £25,000 cheque. The three leading contenders for the £15,000 women’s first prize are now Anna and Mariya Muzychuk, and Tan Zhongyi on 6 points. Current women’s world champion Ju Wenjun’s chances were delivered a severe blow when she was beaten by Nils Grandelius, so she remains on 5½ and has to hope that the three players above her slip up, particularly Mariya Muzychuk, whose TPR (the first tie-break) looks the healthiest of the three. Mariya Muzychuk drew with GM Jules Moussard of France, while Anna Muzychuk defeated Antoaneta Stefanova and Tan Zhongi beat Sébastien Mazé of France. Last year’s winner Pia Cramling looked in the running to reach 6 for a while but was eventually held by Israeli GM Victor Mikhalevski. As well as Ju Wenjun and Pia Cramling, other women contenders in the second score group on 5½ are Humpy Koneru (India), who drew with Vassily Ivanchuk, and Sabrina Vega Gutierrez (Spain), who beat Aleksandra Goryachkina of Russia. 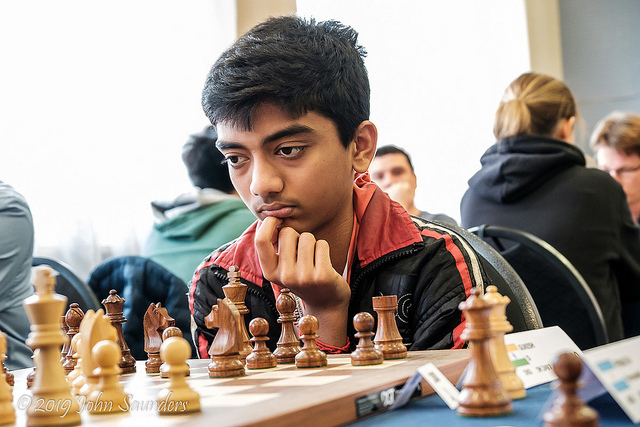 A lot of eyes have been on the remarkable exploits of 12-year-old Dommaraju Gukesh during this tournament and he claimed a second GM scalp in this round, defeating Argentinian GM Fernando Peralta to reach a score of 6/9 and a TPR of 2648. This would have been another GM norm had he needed it, which he doesn’t, of course, having already become the second youngest GM in history. The youngster played a very risky opening, castling on the opposite side from his opponent and flinging the pawns in front of his king down the board. The engine thought he was objectively lost at one point but in a practical fight his connected passed pawns were hard to stop. Peralta failed to stop one of them advancing to one square away from promotion and thereafter Gukesh’s tactical skills proved the better. It’s well worth playing through this hard-fought scrap of a game as it gives a clue to the youngster’s fighting quality and Tal-like ability to navigate his way through extreme complications. His supreme test will come in the final round when he has a mouth-watering pairing with ‘the Beast’ – Baskaran Adhiban. That one will be well worth following live – see the note about the round start time below. N.B. The tenth and final round takes place on Thursday at the earlier time of 11.00 local time (GMT+1). Annotated games in CBV format from the above report can be found here.